Common Ground, 22" x 22". This quilt was created for and will be shown in A Sense of Community exhibit of Canadian and American Quilters at the Embassy of Canada, Washington, D.C. March 7 to May 24, 2019. The grounds of the flags of the United States of America and Canada are united by their common colors of red and white, just as we are united by the continent we share, and the bonds of friendship between our people. I wove together the colors of our flags, creating four blocks to represent Canada and four to represent the U.S. The ninth block is an applique landscape of the Rocky Mountains, our common range. Spring. 18" wide x 24" long. $225.00. Hand printed lettering, applique, quilting, bee charms. Georgie and The Twins, 23" wide x 27" long, $475.00. Donkey and baby raven appliques made from Stonehenge and solid fabrics, shaded with Inktense pencils, layered on wool and cotton batting along with the fence pieces, satin stitched to hand painted fabric with silk and cotton threads. Machine quilting and hand stitched accents. SOLD Butterfly Convergence 28" x 28". Pieced, appliqued and embellished with braid, thread, buttons, trims and a push pin. This quilt was selected as a finalist in the 2016 Hoffman Challenge and was chosen for the 2016 traveling exhibit. Dinner Conversation 34" x 37". $800.00 Hand dyed and commercial fabrics, tulle, silk and cotton threads. May in Chicago, 32" x 32". Hand painted fabric portrait of May Dahlberg with Swedish design wool applique jacket and cap on collage background depicting early 20th century Chicago cityscape. This quilt was in Sacred Threads 2017 in Herndon, VA. When Sun Bear Saw the Bat Eared Foxes, 30" wide x 37" long. $525.00 Inspired by the sun bear, a threatened species, native inhabitant of Asian rainforests and now conserved in zoos, that can appear to be laughing. Cotton fabrics,silk and cotton threads, silk/cotton/tencel batting, colored pencil, textile paint, India ink. This quilt was in the 2016 American Quilter's Society show in Lancaster, PA. Sometimes Friendship Can Be Sticky, 31" high x 24" wide. $900.00 Hand dyed and printed fabrics from Ghana and Nigeria, batik and commercial fabrics, thread, folded paper, fabric paint. This quilt was in ArtQuiltsWhimsy!, PAQA-South's 2014 international juried exhibit of fine art quilts and was featured as the cover art for the exhibit. Award winner - First place Art Quilts, Southern Comforters 2015 Quilt Show. This quilt was chosen for Sacred Threads 2015 in Herndon, Virginia and was a finalist for the 2015 International Quilt Festival in Houston, TX. It was selected for Art Quilts XXI: In Stitches - Seriously Humorous Art Quilts at Vision Gallery in Chandler, AZ in 2016. SOLD Ambassadors of Peace, 39" wide x 46" long. Hand dyed fabrics, commercial fabrics, tulle. Monarch butterfly populations are declining, drawing attention to the environmental challenges facing our world. Award winner - Second place in Applique Quilts and Vendors Choice Award from Phyllis Twigg Hatcher, Certified Quilt Appraiser, Southern Comforters 2014 Quilt Show. This quilt was selected for the 2014 American Quilter's Society show in Paducah, Kentucky and for Sacred Threads 2015 in Herndon, Virginia. In The Woods, 46" wide x 25" long, $650.00. Hand dyed and commercial fabrics, screen printed, embossed, hand and spray painted, fused, colored with fabric markers and wax pastels, satin and free motion stitched with solid and variegated thread. Award winner - Second place Art Quilts, Southern Comforters 2014 Quilt Show. Spring Ikebana, 38" x 28". Japanese printed cottons, dupioni silks, velvets, ultrasuede, thread painting. Award Winner- Second Place Applique Quilts, 2013 Southern Comforters Quilt Show. Winter Ikebana, 25" x 44", $425.00. Printed cottons, dupioni silk, ultrasuede, lace ribbon, thread work, beads. Award winner - third place wall quilts, appliqued/mixed techniques, 33rd Annual Smoky Mountain Quilt Show. 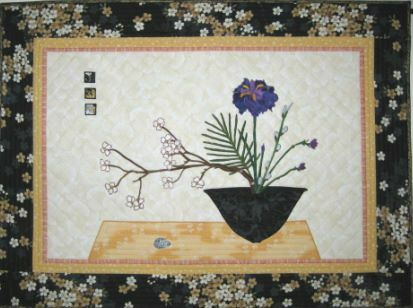 Summer Ikebana #2, 25" wide x 37" long, $350.00. Cotton and metallic etched fabrics. SOLD Emergence#2, 28"x39". Fabric collage with 3D silk and ultrasuede butterflies and caterpillars made from Estaz fiber.